A brooding crime thriller, A Walk Among The Tombstones creates a promising ambiance of mounting dread, but fails to develop its characters and stagnates into an unconvincing kidnapping procedural. It's 1991 in New York, and police detective Matt Scudder (Liam Neeson) is partially drunk when he gets involved in a wild shootout and takes down three armed robbers. He leaves the force, quits drinking and starts a new career as an unlicensed private detective. Eight years later, Scudder is approached by drug dealer Kenny Kristo (Dan Stevens), who wants Scudder to find out who kidnapped and then viciously murdered and dismembered his wife. Her remains were stuffed into the trunk of a car despite Kristo coughing up a $400,000 ransom. Scudder starts to investigate and uncovers a string of similar kidnapping, ransom and murder crimes, including a case where the remains of another dismembered woman were left strewn all over a graveyard. The perpetrators are a couple of monstrous men kidnapping family members of drug lords. Their latest target is the daughter of Russian mobster Yuri (Sebastian Roché), and Scudder inserts himself into the case to try and save the young girl's life. 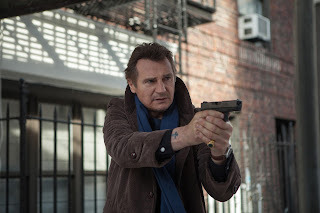 Directed by Scott Frank as an adaptation of the Lawrence Block novel, A Walk Among The Tombstones offers an intriguing protagonist in Matt Scudder, with Liam Neeson at his best in creating a modern day Sam Spade or Philip Marlowe (the script is filled with references to the classic pulp detectives). Scudder is suitably tortured, a loner more comfortable when surrounded by sleaze, and in a constant fight against his internal demons. He is presented with a case well suited to his agony, criminals targeting criminals, murderers all but with sufficient distinctions in the grey zone of brutality for Scudder to get involved. With an aesthetic dominated by washed-out greys and browns, for the first 30 minutes Tombstones promises to be a worthy addition to the list of notable, cynical and dark detective thrillers. But then Frank starts to seep momentum, and the film loses its way. The irrelevant introduction of scrappy street kid (Brian "Astro" Bradley) as an annoying sidekick backfires. The murderous kidnappers remain opaque barbarians with no backstory, and the victimized and almost interchangeable drug lords fare no better. In a case of ill-defined scum threatened by unexplained scum, it gets increasingly difficult to care who lives, who dies and why. Worse of all, the women who die are never more than abstract names, with a couple of superfluous scenes of implied torture thrown in. Neeson's commitment to the cause and Scudder's ice cold, dead-inside confidence occasionally threaten to save the day, but ultimately the film just lays to rest with a tired whimper.